Stockton Mayor Mark Whitney stands by the town’s water tank, which was destroyed last month after an arson-caused wildfire spread from nearby fields to the structure. Whitney looks at debris in the town’s water tank. 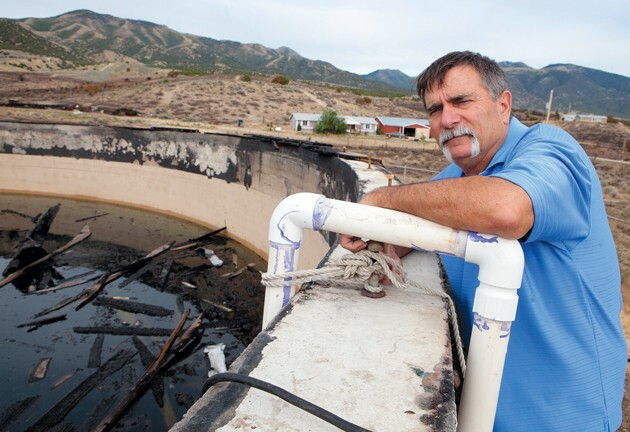 To replace the tank, which was destroyed by a wildfire last month, will cost $950,000. The town hopes insurance and the state water board will help cover the cost. Stockton Mayor Mark Whitney looks at debris in the town’s water tank. The tank was destroyed last month after an arson-caused wildfire spread from nearby fields to the structure. Damaged by fire and made obsolete by age, Stockton’s water tank is a lost cause, say town officials. 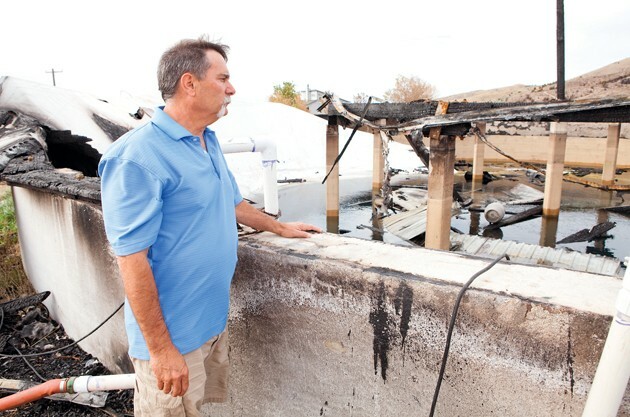 Stockton Mayor Mark Whitney said the town’s contracted engineers and insurance company have agreed the century-old, 500,000-gallon water tank damaged by last month’s wildfire is irreparably ruined. At a presentation to the town council last week, engineers summarized the damage — the ruined wooden top, the damaged first two feet of concrete, the marred concrete pillars that held the wooden top in place. Whitney said to repair the damage would incur significant cost because many of the aspects of the tank will have to be updated from its grandfathered standards. “For us to reuse that tank, we’d have to do a major rework of the tank, put in new pillars to hold a cement roof, because we can’t put a wood roof on it — that’s against state regulations for drinking water,” he said. To replace the water tank, though, also carries a high price tag: $950,000. Whitney said the town is still in negotiations with its insurance company, and a final commitment of what insurance will cover has not yet been reached. 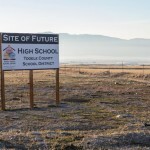 For the remainder, he said the town will seek help from the Utah State Water Board and ideally get a grant or no-interest loan. 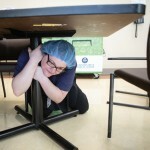 In addition, engineers are trying to find the best place to put the new tank. “We’re evaluating sites, doing engineering, kind of going through the detail of design and where it needs to go, hydrolic modeling, and ensuring where it goes is the best place for the town with pressure, flow, that kind of thing,” he said. 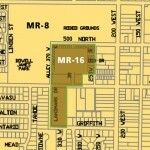 The plan will be presented for approval from the town council at its regular meeting Thursday at 7 p.m. Whitney said he does not anticipate much conflict in the decision. 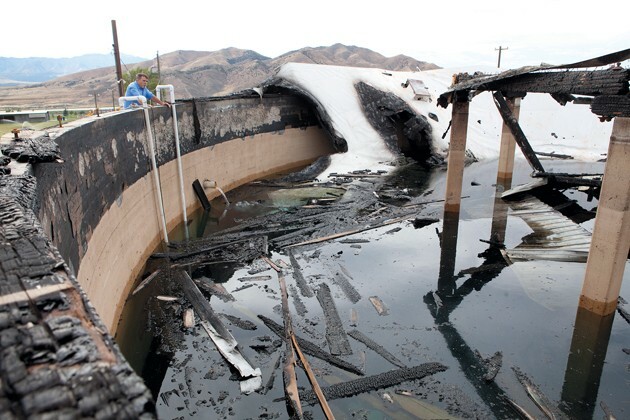 The water tank’s wooden top caught fire on July 16 after an arson caused wildfire roared past the structure. That wildfire threatened the eastern side of Stockton and forced evacuations. Damages to the tank contaminated the town’s culinary water supply and resulted in a temporary “no use” order while officials cleared water lines. The no use order was lifted three days later, however residents were restricted from using culinary water for outside watering. That restriction has been partially lifted with only brief use of culinary water allowed for lawns and gardens. To supplement, residents have been using irrigation water from Soldier Canyon. A spicket at the town’s ball park has been used by residents for irrigation water access since the fire. Does the arsonist bear no financial responsibility at all – even minimally? I realize a private citizen could not make a dent in the $950K needed to replace the tank, but it seems there should be some penalty for setting the fire that caused the tank’s failure. Was the ‘spicket’ mentioned in the last paragraph supposed to be a ‘spigot’?